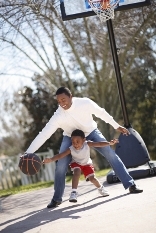 Try these [tag]basketball youth drills[/tag] if your coaching little league boys basketball. This is a simple [tag]basketball drill[/tag], if you want to call it that, and it is something my 4th grade coach taught me. I’m 6’4″ so to teach my kids how to keep the [tag]basketball[/tag] up high I walk up to them with the ball held at my waist & tell them to try & smack the ball away, which is very easy. Then I hold the ball up over my head & tell them to do the same thing; okay, they can’t. Then I explain that if I hold the ball at my waist that’s how tall I am & the ball is easily stripped. Another simple basketball drill is to put a small cone about 2 or 3 feet from the basket at a 45 degree angle. Have the kids jump over the cone during these [tag]basketball layup drills[/tag]. This gets them to jump and also keep their speed up going to the hoop. A lot of young kids stop and shoot. You may have to adjust the distance of the cone depending on age or ability.